Encourages early math skills, pattern and color recognition, fine motor skills, and hand-eye coordination. Composed of 55 beads and two interchangeable double-slide boards which feature more than one way to play, you can add or subtract or simply color match the beads with the background, making it a perfect toy for an early age. Ideal for a first toy the Melissa & Doug® Add & Subtract Abacus, is the perfect toy to introduce your little child into the world of mathematics, with its colorful wooden beads they will be able to experiment with the toy while still learning the basics on counting. This toy is composed of 55 beads and two interchangeable double-slide boards which feature more than one way to play, you can add you can subtract or if your child is not old enough he can begin simply to color match the beads with the background, making it a perfect toy for an early age. The more interaction your baby has with this toy he will begin to develop math skills, pattern and color recognition, and and even some eye-hand coordination. 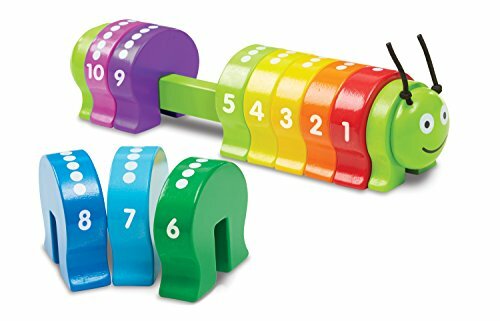 The Melissa & Doug® Add & Subtract Abacus will provide your child a safe and fun way to experiment with numbers and its sturdy wooden material makes it the perfect pick for an enduring toy. It will also, when the kid is old enough, leave some space so that they can interact with the numbers with the help of the color and amount of beads they will be able to count in no time, but if your child is a baby then this can help him recognize the different colors and begin to recognize other wooden objects. This visual and physical stimulus is great for a forming mind and will provide the initial development of the fine motor skills and coordination, while helping your kid learn the mathematical basics that are adding and subtracting. This is a great toy to get for a kid who seems to enjoy math, as it will help him develop himself in the area, until each colored ring row represent higher and higher amounts for him, to the point where he/she can use it in his daily school life in the future.